I seriously don’t have enough good things to say about this book. I borrowed this copy from the library, but I already have plans to order a copy to keep, because its an amazing resource. Not just for parents, but for librarians and teachers too. Also, I want to say that of all the read-to-your-kids books that I’ve read, this is one of the few, maybe the only, that actively encourages using the library and talking to librarians. I felt so appreciated. The book tracks Boog’s reading experiences with his young daughter Olive from her birth to Kindergarten. Along the way, he discusses the importance of interactive reading (if you read anything in this book, make sure its the introduction). He provides awesome booklists for every stage and the pages are filled with reading activities, app activities for parents and children to do together. Its a great way to see literacy intertwined with everyday life. From having books in the bathroom during the potty-training stage, to have books at the dinner table and in the car. His reading relationship with his daughter is commendable. I’d like to say that he’s this generation’s Jim Trelease. I must sound like such a groupie. But this book is awesome, and I think its one that should find its way into school curriculum for teachers and librarians. I think its really important for all of these figures in a child’s life to bring the same messages and examples at every stage of their lives. I want to know what the parents are reading, what the kids are reading so that I can make sure that my library is stocked with books that will be of value to them. That will help guide their curiosity and enhance their experiences. The sections on interactive were the most interesting for me. There are about a dozen different tactics to use when reading with your child. From pointing to pictures on a page, to asking questions about the illustrations and the story. This type of reading has been shown to increase IQ points as well as overall reading comprehension level, putting some children ahead 6 to 8 months from their peers. Something so simple can have such a huge impact. I mostly let out a sigh of relief when I realized that this is not only how I read to my son, but also, its how I read during my storytime performances. I like audience participation. I just didn’t realize that it would benefit the kids in such a strong way. It’s not only important THAT we read with children, but also HOW we read with children. Born Reading will show anyone who loves kids how to make sure the children they care about are building a powerful foundation in literacy from the beginning of life. 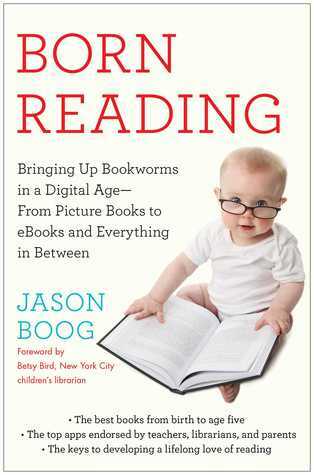 This entry was posted in Books and tagged born reading, jason boog. Bookmark the permalink.